It has been a long time since I made quesadillas. I decided to make my old stand-by Spinach Mushroom Quesadillas, but this time with Daiya pepperjack-style shreds. They turned out yummy! Heat a skillet or saute pan to medium heat. Saute the mushrooms and onions in oil until the mushrooms soften and the onions become transparent. Heat the black beans in their sauce in a separate saucepan. Once heated, place the black beans on half the tortilla, top with some of the mushroom/onion mixture, followed by several spinach leaves and top with some Daiya shreds. I usually use enough Daiya to cover the spinach. Repeat for the other tortillas. 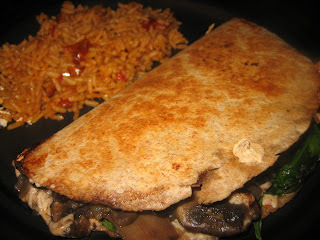 Fold the tortilla in half, then spray some cooking spray onto a skillet or on a cast iron grill and cook until browned. Flip and brown the other side. If you are making many of these, I'd suggest storing the warm ones in a tortilla warmer or just reheating each of them in the skillet for a minute before serving. Top each quesadilla with guacamole, jalapeno peppers, and salsa. These are great served with Spanish rice as well. This newest flavor of Daiya is delicious! Just like the other two flavors, it melts and tastes great. It is the pepperjack flavor I always loved and missed. If you haven't tried it yet, run, don't walk to a store near you!